In our second year of awards, the Mouse for Less Academy of Disney Culinary Arts and Sciences recently get dressed up and awarded the Top 10 Fine/Signature Restaurants at the Walt Disney World resort. Now, we are ready to dress a little more comfortably and bring a healthy appetite. 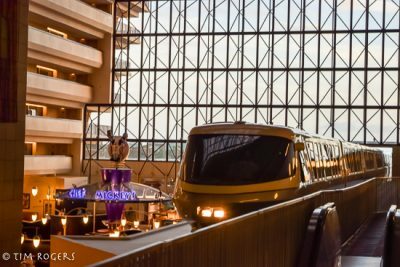 That’s right, once again thanks to the voting of the members of the Mouse for Less Facebook group, we have a definitive list of the Top 10 Buffet and Family-Style Restaurants at the Walt Disney World resort. You can find the full list here, and then continue on for some explanation and personal experience on what makes these restaurants special. In the spirit of award season, we’ll make some up to give out. Akershus is a really interesting place, for a variety of reasons. First, it is one of the few princess meals, which makes it incredibly popular. More than that, it is a kind of hybrid between buffet and family style with a unique cuisine in the dining center of Walt Disney World, the World Showcase. 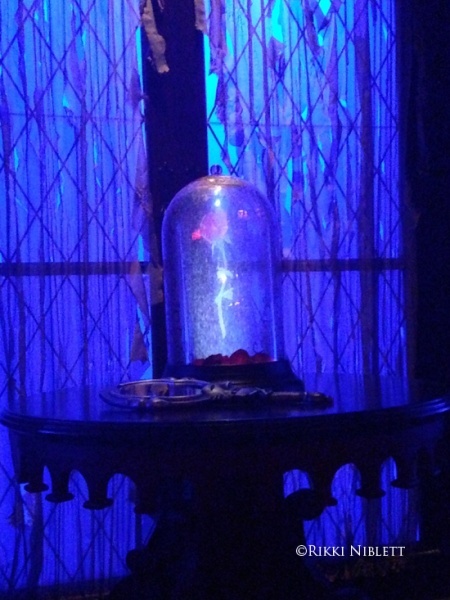 So while I joke about how it is just known in reference to Cinderella’s Royal Table, Akershus definitely has a lot going for it on its own. If you are going to Hollywood and Vine, it is probably mostly for the environment, so I’ll focus there. First, the breakfast with Disney Junior characters is the only place in the Walt Disney World resort where you can do such things. Moreover, the growth and expansion of Minnie’s Seasonal Dining has really sparked new interest and popularity in this location. Liberty Tree Tavern might normally bring patriotic puns to a traditional family meal, but it is also a great spot to enjoy a full Thanksgiving Dinner if you happen to be visiting the Magic Kingdom but still want to feel like home. Epcot’s World Showcase is known for its culinary offerings – you can explore great tastes from across the world to fit nearly any palette or interest. Even with that wide range of fantastic choices, it is easy to understand why the Biergarten is so popular. First, the food itself is great. I wrote before about my experience going there as a vegetarian, but the meat-eaters among us seem to enjoy themselves even more. However, what I think really sets this restaurant apart is the atmosphere. When you walk inside, you are suddenly under the stars in a Bavarian Biergarten, and you are brought to shared tables to enjoy your meal. In the center of the restaurant, a traditional German musical group performs a great show, complete with tubas, xylophones, Alpine horns, and more. 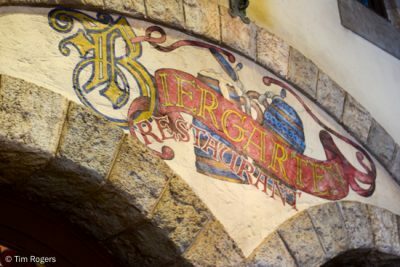 When you think of the themeing Disney is know for providing, a shining example of that attention to thematic detail is definitely the Biergarten. 7.) Bravest Taunting of Motion Sickness…Garden Grill. 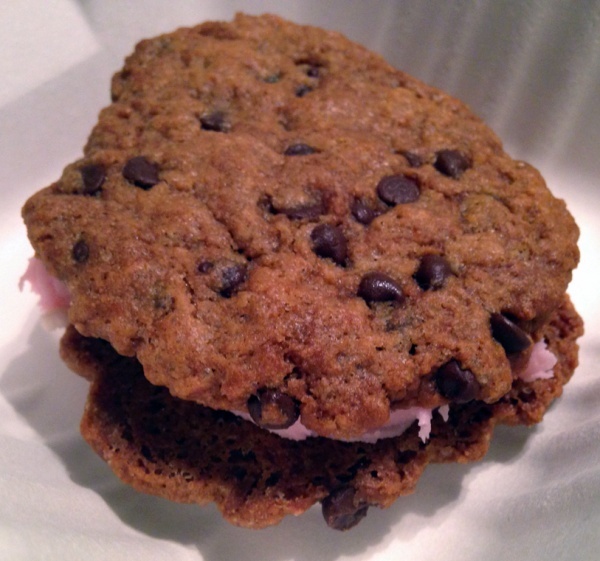 The Garden Grill is great American food done with a twist…literally. Located in the Land Pavilion in Epcot, Garden Grill offers a harvest feast accompanied by Chip and Dale (and other friends) all while the restaurant slowly spins, showing off views of Living with the Land during your meal. In a way, this combination of characters, good simple food, and a unique experience is the epitome of what Disney dining strives to be, and it makes perfect sense that this restaurant would have a dedicated following. 1900 Park Fare’s, located in the Grand Floridian, is both incredibly popular and a hidden gem at the same time. It has a great diversity of offerings, from the breakfast buffet with British-tied characters (Winnie the Pooh, Mary Poppins, Alice in Wonderland) to Dinner with Cinderella, Prince Charming, and other members of the royal family. During the day, you can also attend a children’s tea party here. Not many restaurants offer this sort of diversity in experience. It gets overshadowed both by the great dining elsewhere in the Grand Floridian, and with other similar character meals, but 1900 Park Far has really earned its place as one of the best. We’ve all seen them – the picture perfect commercials of Walt Disney World. You see a happy family enjoying time together, having some great food like a Mickey waffle, and then they happen across a favorite character and the monorail rolls by. Well, at Chef Mickey’s you get all of that at the same time. This family favorite in the Contemporary is one of the hardest reservations to get, but if at first you don’t succeed, keep hitting refresh! 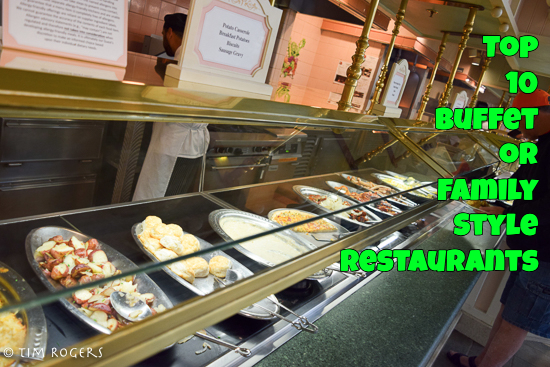 Most all you can eat locations, especially buffets, in Walt Disney World are a character meal. However, it takes a special place to bypass all of the extra nostalgia and emotional joy characters can add to a meal with just food. Boma does just that. Many people will go for the inventive soups or the fish station, but anytime you can have all-you-can-eat Zebra Domes, you are having a good day. In almost anyone’s list of a must-do dining location, ‘Ohana will be near the top. First, the all you can eat breakfast includes visits from Lilo and Stitch. Then, at dinner you can enjoy all you want from a variety of meat skewers, noodles, wings, and more while family friendly games and activities occur. ‘Ohana exemplifies a restaurant that showcases a variety of experiences in a wonderfully themed environment with unique food. When all of that comes together, Disney fans respond and come back again and again. However, is anyone else surprised that Lilo ans Stich haven’t been joined by Moana and Maui yet? In all of the trips I have been able to take to Walt Disney World as an adult, there is only one restaurant I have eaten at every time – The Crystal Palace. Located just off the hub in the Magic Kingdom, Crystal Palace is a beautiful location that has a great breakfast (try the lasagna!). However, the reason I’ve gone every trip has less to do with the food and more to do with the donkey. 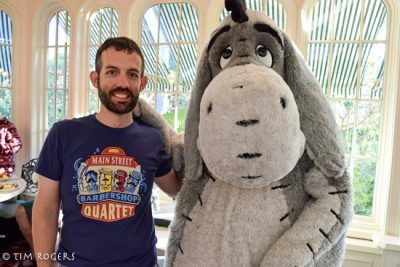 My wife loves Eeyore, and seeing her light up whenever she gets to see him is special for me, but also doesn’t hurt for planning that next trip. 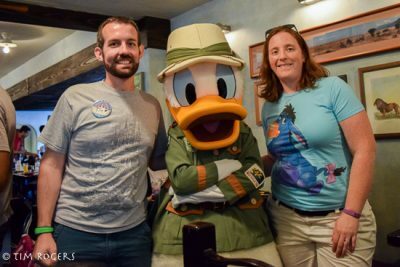 All it took was a single visit to the Tusker House for my wife and I to move it from a place we wouldn’t mind trying, to one of the best meals we’ve had at Walt Disney World. While still accommodating those who might be pickier eaters, Tusker House also has some of the best vegetarian options on property, and a really interesting menu overall. On top of that, the Safari characters here are a fun and interesting take, and they are ready to take you on a culinary adventure. What are your favorite Buffet or Family-Style Restaurants? Share in the comments, or on Facebook or Twitter. We went to the Crystal Palace for the first time on our last trip. The food was fantastic, we enjoyed meeting the characters, and the atmosphere was just bright and cheerful. I also enjoyed the topiaries near the entrance of the restaurant. If Eeyore is your wife’s reason to visit Disney, going to The Crystal Palace is definitely a solid vacation planning strategy. Great list. If you have not been to Trails End for Breakfast, you are missing the best breakfast buffet on Disney. You can catch the bus or boat from Wilderness Lodge, Trails End is at the edge of the campground. Wonderful, delicious food, fantastic staff and after eating you can visit with the horses and ponies. Then, catch the bus or boat back to Wilderness Lodge. Simply delightful. Ooh! Thanks for the tip! Also yum! The boat also comes to and from Contemporary to right out front of Trails End. I have been going to Disney for over 30 years, Annual Pass Member, my friend is DVC (two widows) and we go at least 5 times a year and stay at DVC hotels. Trails end is by far the best of the best. Try the moonshine, a mix of fruit juices, wow. Reasonable, also.